Please intercede for the future spouse of D and T. Please comfort T’s family in this time of sorrow. I pray that on July 26th, your feast day and mine also, Carlos writes to me and that this may be the first step in coming back together. This would be the best gift on my feast day. Please Holy Saint Anne, help me with my plans to find a new and more gratifying job. Help me also to find new friends or reuniting with old ones. As always I pray that the heart of my stepmother will soften, her hostility causes so many problems to the whole family. I pray for strength so I can cope with the problematic family of my mother. Please solve in som way the transexual problematic that B suffers from. Make B man OR woman. This in between thing is so painful. Thankyou dear Saint Anne for listening to my prayer. Amen. I ask through this Novena to meet my future husband as Anne Marie has,so I may be able to also share my story. He is wise, He is Alpha Male, a gentleman who provides for his family, loving, respected, puts my daughter first,health conscious , god-fearing, patient, financially stable and accomplished with confidence and makes me recognize him by pursuing me to no end, because I know he is coming very fast. I would love to birth another healthy child with him. I also pray that others who will block this to be moved on to their best life as my life becomes better and better. As a grandmother of 6 children and 11 grandchildren, I ask to be protected from a scam I may have signed up for. Please pray with me as I ask for this special blessing. Prayers for my mom. She is hard working and forever faithful. Give her strength as she goes through her day, today and always. Please St. Anne pray for MS and AV to begin a serious relationship eventually leading to Holy Matrimony. I promise to encourage devotion to you and my beloved saints, St Jude, St Anthony, the Sacred Heart of Jesus and the Blessed Mother. Please hear my prayers. Saint Anne thank you for hearing my prayers. Please intercede for us while praying for family, friends and all persons longing for answers in their suffering. Guide us in our daily ventures and may we have the protection of the Holy Spirit dwell amongst us. Praying for all marriages especially individuals thinking of marriage in the near future. Protect the family and the values of the Catholic Christian faith. Praying for divine knowledge and wisdom, through Christ our Lord. Pray for the youth to be strong and wise and to be always steadfast in their faith. Amen. Most glorious St. Anne, thank you for interseshion in mine & all our prayers. I have been holding down this bed for 9ish years after a freak accident 23 yrs & only being married for 7 yrs. before. Your intermeshing is greately appreciated I will never forget. O Gloriuos Saint Anne pls pray for my daughter and son in law may they mend their marriage and be able to trust each other again. May the find Jesus and Mary so they can strengthen their marriage. May my youngest daughter find an honorable God fearing man that wants children to marry. Thank you all for your prayers. May God bless you all by answering your prayers. Please pray that I and my single friends will find MR. Right as well as my kids will find their significant other. Sometimes, I feel we are stuck in a stand still situation. God is good! Please pray that my daughter get a permanent job with the school Board and meet her husband. pray that my son become more motivated and focus on completing his degree and working toward a more rewarding career. pray for good health and strength for my mother and that she will put away her pride and communicate better with her children. I ask that God will send my daughter that one special friend who will lift her up to the wonderful you lady she is becoming. Conversion of sinners. 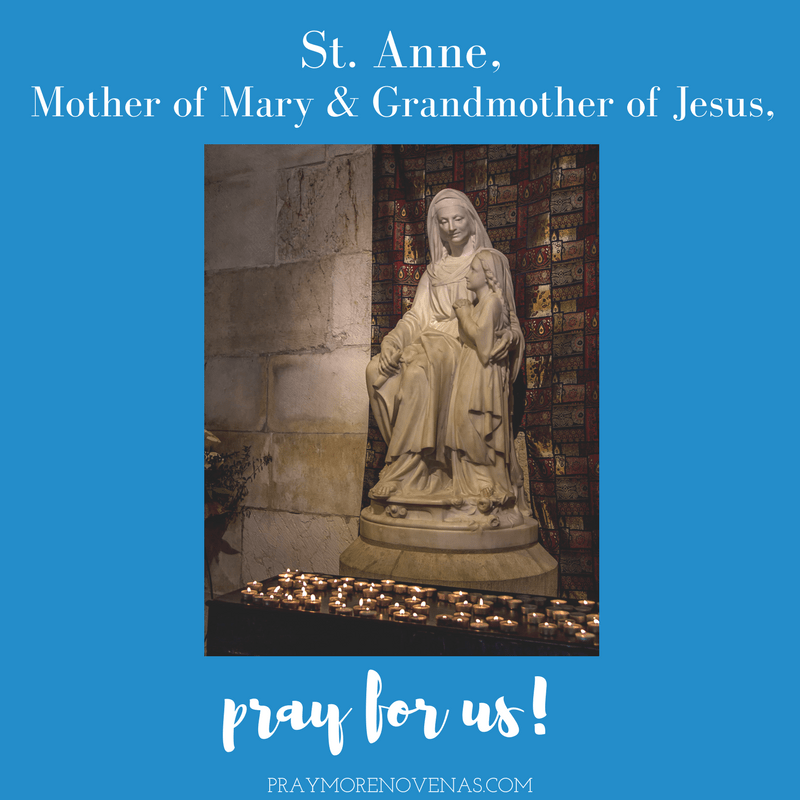 St Anne I pray and ask you to bring all my needs and intention to Jesus. For my daughter her exam is coming very soon fill her with your understanding and knowledge to achieve what I want and for her future. Praying for the restoration of my husband’s health. Please help my son with his education and path. Please help my daughter with her health, job and education. Jesus, I trust in You, I trust that You will lead me today to the places and people where I need to be, where I need to love, where I need to serve. I trust You’ll give everything I need to accomplish these things & to give Your love & mercy to those closest to me. I trust You’re with me every single moment of the day, especially in the darkest moments. I trust that You have a plan for me & my life, and that You also know the desires of my heart, & that Your plan is for my good. I trust that Your plans are always for my good and that Your ways are always for me. Lord I place my son into your hands. I pray for money to pay his tuition fees which is over due. Lord please may a way when there seems to be no name. Lord I place my financial needs into your hands. Please pray for us grandmothers who are so lonely and hurting that we are inconsolable. If it were not for our faith we would be lost. I pray for all people that are playing this novena and their intentions . Jesus, I trust in You! Let todays prayer help me to achieve what I am asking for ,for all these months. S AND N must be approved in the name of Jesus with good results. Please also lift up my spirit because I am feeling down . I ask that you continue to guide and protect my mother and as she has set great examples to all her children, may we do the same to our children, grand children and great grand children. Dear St Anne, pray for my daughter who so much wants to find her soul mate and raise faithful children as you have done with Mary. Let her faith in Christ guide her to that person. Amen!